Alexander Keith's Light Ale is light in colour and hopped in flavour. Available only in Nova Scotia, PEI and New Brunswick, Keith's Light Ale is known as a light tasting ale whose subtle black licorice/anise notes contribute to its character. In terms of flavour, Alexander Keith's Light Ale is known for its clean bitterness, slightly sweet/malty flavour and light body. It is also smooth and well balanced, with a light ester undertone which gives Keith's Light Ale its floral/fruity nose. 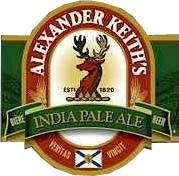 Alexander Keith's Light Ale is only brewed in Nova Scotia and is a great complement to the region's most popular beer, Alexander Keith's India Pale Ale. With an alcohol content of 4% by volume, it has a very clean taste that makes it a highly drinkable beer. La Alexander Keith ´s Indian Pale Ale comenzó a fabricarse en 1820, cuando el propietario de la empresa decidió producir cervezas de calidad que resultaran al gusto de un amplio sector de la comunidad. Esta peculiar Indian Pale Ale es una ale de color amarillo claro con una pequeña corona de espuma de inconfundible efervescencia. Su sabor es una agradable combinación de acre y dulce con notas adicionales de albaricoque, miel y caramelo de mantequilla. proporciona también un excelente retrogusto a frutos secos y, por lo general, es muy refrescante. No obstante, algunos críticos sugieren que la Alexander Keith´s IPA no es una Indian Pale tradicional porque no contiene suficiente malta. Otros recomiendan tambien consumirla como cerveza de barril mejor que embotellada. Pero a pesar de la diferencia de opiniones, cuenta con un gran número de partidarios entre los consumidores canadienses de ale. Tiene un 5% de Alcohol y su temperatura recomendada de consumo es de entre 5º y 7ºC. Se recomienda beber como acompañamiento al pan con queso cheddar maduro. Alexander Keith's Red Amber Ale is a premium offering from the great family of Keith's beers. With its dark amber colour and rich red overtones, Keith's Red Amber Ale offers you a specialty beer experience. This smooth, well-balanced ale is brewed to the exact standards first laid out by Alexander Keith over 185 years ago. It is rich in every sense of the word - rich in colour, rich in heritage and rich in taste. Available NOW in Nova Scotia, New Brunswick, PEI and Quebec. Those who like it, like it Red!! Available only in the Maritimes, Honey Brown Ale is a highly drinkable and refreshing beer. Made from pale, caramel, and chocolate malts, with the usual Keith's ale yeast and a splash of Nova Scotia honey gives it a flavour that is malty sweet upfront, with some honey notes. Alcohol content of 5%.